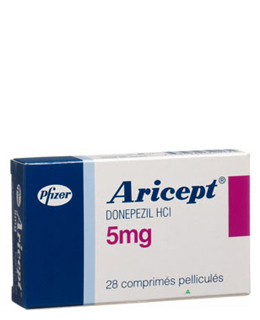 Aricept (Donepezil) is a reversible inhibitor of anticholinesterase, and is licensed for the treatment of mild to moderate dementis in Alzheimer's disease. 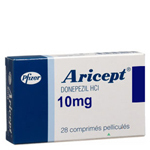 Aricept (Donepezil) is a reversible inhibitor of acetylcholinesterase. Benefit from Aricept (Donepezil) is assessed by repeating the cognitive assessment at around 3 months. Such assessment cannot demonstrate how the disease may have progressed in the absence of treatment, but it can give a good guide to response. 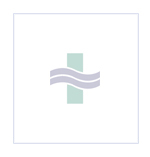 Up to half the patients given this class of drugs ( including Aricept) show a slower rate of cognitive decline. Donepezil is recommended by NICE for the adjunctive treatment of moderate Alzheimer’s disease in those whose mini mental-state examination (MMSE) score is 10-20 points under the following conditions: 1) Alzheimers disease must be diagnosed in a specialist clinic; the clinic should also assess cognitive, global and behavioural functioning, activities of daily living, and the likelihood of compliance with treatment 2) Treatment should be initiated by specialists but can be continued by general practitioners under a shared-care protocol 3) The carers’ views of the condition should be sought before and during drug treatment 4) The patient should be assessed every 6 months and drug treatment should normally continue only if the MMSE score remains at or above 10 points and if treatment is considered to have a worthwhile effect on the global, functional, and behavioural condition. 5) Patients receiving acetylcholinesterase inhibitors for mild Alzheimer’s disease can continue treatment until they, their carers, or their specialist consider it appropriate to stop.